If you’ve ever ventured up to your attic on a sunny day, you may have noticed how incredibly hot the air is. Though it may not have seemed all that warm outside, heat from the sun conducts through your roof, substantially raising the temperature of the air in your attic. This heat distributes to other areas of your dwelling – through attic surfaces, air ducts and the attic floor. The result? You may need to crank up your air conditioner just to stay comfortable, and that means, your roof, and the sun, are costing you money! With a little time and reasonable investment, there is an excellent way to improve comfort and reduce energy bills. Many professionals recommend installing a radiant barrier in homes and buildings. Not only do radiant barriers minimize heat transfer, they also prevent dust accumulation on reflective services, which reduces the buildup of harmful microbes. Engineers have found that aluminum is one of the best materials for this purpose due to its reflective qualities and reasonable cost. Aluminum “foils” are affixed to both sides of a substrate layer made of plastic film, cardboard or kraft paper. To increase the durability, fiber reinforcement is also used for these barriers. Installation of these foils can provide instant relief, sending unwanted heat energy back through your roof and out into the atmosphere. Amazingly, aluminum radiant barriers are capable of blocking approximately 95% of the heat transferred through the roof! Radiant barriers can also be used in space like garages, porches and workrooms – any place in your home that has a direct line of the sun. The effectiveness of radiant barriers mostly dependson proper planning and installation. Looking for a professional team to manage the job is a great idea. Quartz Solutions has extensive experience in radiant barrier installation, and is licensed and insured. 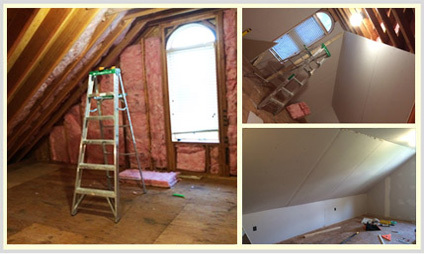 We have a passion for improving attics and crawl spaces, offering quick response times, and the highest quality work. Call our office today to schedule your free inspection.